Leading a string of 15 horses, Mr. Trav Rogers arrived in Palm Springs. It was 1929. So began the storied history of The Stables and Rogers Ranch Club located on Chia Road. With an informal western motif Rogers Ranch became popular with the monied set. Fast forward to today and prospective residents are welcomed by a variety of housing options in this area. Four home owners associations (Sagewood, Ranch Club Estates, and Sunrise Racquet Club) along with the Philip Caplin Vista Sunrise Apartments/Desert AIDS Project, form the Sunrise-Vista Chino Neighborhood Coalition, north of Tachevah Drive and south of Vista Chino. Sagewood condominiums arose from the dust of The Stables. Built in 1972 and designed by Donald Wexler, the simple lines and natural colors blend with nature and its deep window overhangs are all Wexler trademarks. Originally Palm Springs’ first seasonal condominium project, Sagewood now houses year-round residents. West across Sunrise Way, Ranch Club Estates, a two-story condo complex, retains the original Rogers Ranch Club pool. Unlike the open feel of Sagewood, Ranch Club Estates gives one the feel of being nested in a hideaway. Second-story condo units enjoy spectacular views of the pool and tennis courts. 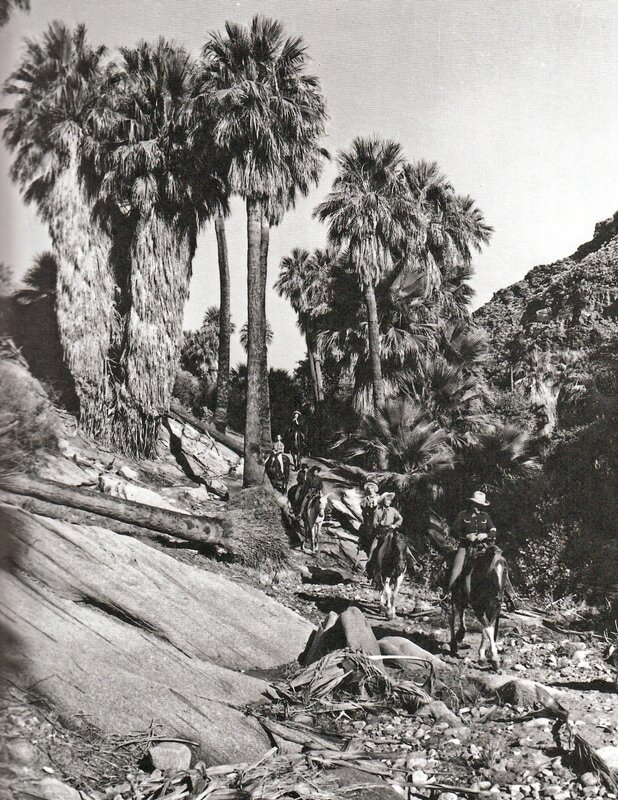 Betty Hutton lived here until the paparazzi found her in 1999.Take a drive on Sunrise Way from East Palm Canyon Drive to Vista Chino and see the 1970s growth of condominium projects. Sunrise Racquet Club’s sales brochures (including the 1977 artist's rendering at right) billed the walled development as an exciting new residential oasis with many amenities and water features. “Old timers” remember the line of potential buyers snaking around the block. The "Jurassic Park Gates,” as they are nicknamed, welcome you to The Colony of El Mirador. Opened in 2000, this upscale community of 35 individual homes sits where the first 18-hole Palm Springs golf course was built -“The El Mirador Golf Course, “Where the poor kids play golf by proxy.” Proceeds from golf fees supported various children’s charities in Los Angeles. The Colony’s west side abuts the Frey House I property. Providing housing to low income people with HIV/AIDS, the Philip Caplin Vista Sunrise Apartments sit west of the Desert AIDS Project. With a sleek modern design the complex will soon be installing solar carports. An active Tenants Council and an on-site manager welcome residents and visitors to its well-kept grounds. We all love the diversity and convenience of our neighborhood. One survey asked residents what they most liked. “Convenient location” was a frequent response, noting the short walking distance to Stater Brothers, Dairy Queen, a dentist, dry cleaner, Dollar Tree, and Walgreen's, to name just a few. “Friendly neighbors” and “peace, quiet, and security” also took spots as frequent responses.